​Cockroaches can be a scary pest to deal with. The ferocity of their movements combined with their size makes them quite a challenge to deal with, especially when there in clusters. We will go through how to identify two strains of cockroaches, where to find them and why you need to call cockroach exterminators such as us to come around and get rid of those pesky roaches. There are two strains of cockroaches that we will look at today – American and German. ​This type tends to be quite a large cockroach. If you were to take an American quarter, then you would notice that the quarter would take about three fourths of the size of the cockroach. In terms of color, the American cockroach has a distinctive red-brown color with an amber look to the coating. Also there is two dark brown spots at the shoulders of the cockroach since this is the only part that does not have the distinctive red color to it. The exterior of this type of roach is glossy around the wings, and body. This makes this type the glossiest in the world. 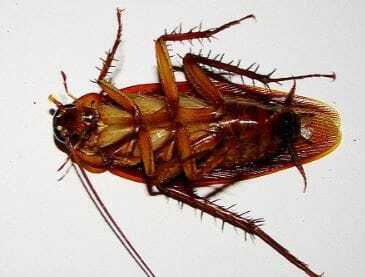 ​This strain of cockroach is distinctive from the two dark stripes that can be found on the exterior from the head to the bottom part of the wings. They are about ½ an inch long. Cockroaches are notorious for being found in some of the darkest, damp places in the house. However, identifying them can be easy. Here is how you can find American and German cockroaches. American Cockroaches are unique in that they only eat moist foods. If you see a cockroach eating your moist food, then it is likely to be an American cockroach. German cockroaches can be found in damp places. When you do find them, they can be found in clusters. If you notice an infestation of cockroaches, then it is likely to be German Cockroaches. ​Since cockroaches are, in many ways, a hazard; you need to call us to get your cockroach infestation under control. If you do not know how get rid of the cockroaches, then this is likely to mean that there is likely to be damage to your property. For every roach that you see, there is likely to be many more that are hiding behind your walls. Not only that, they are able to reproduce very quickly. This means that they are likely to do a lot of damage in your home very quickly. Since the house is an ideal place for a roach, with the warmth, dampness and nesting places, you need to act quickly. Otherwise respiratory illnesses such as asthma. When you call us, we will come over to inspect the cockroach manifestation. We will aim to check every place where roaches tend to hide and try to find the origins of the cockroach manifestation. Then we will apply our extermination techniques such as spraying pesticides and poisons with our special equipment. Clean up of the dead cockroaches will be as simple as possible. Every so often, we will come in and check in again to make sure that the cockroach infestation is not happening again. Preventative measures will be added such as poisons to ensure that the eggs and roaches themselves are killed. So if you think that you have a problem, then call us today. We will be definitely willing to help you.